Vultr vs Digitalocean • Who wins? • Read to find out! Vultr vs Digitalocean. Our story begins in 2011 when a new kid in the VPS market emerged called Digitalocean, they offered cheaper prices and more resources than anyone else out there. Backed with $37m dollars of investment, they were able to go from a standing start to 1,000,000 droplets within 15 months, wiping the floor with most of the competition. That is phenomenal growth. Is Vultr about to do the same to Digitalocean? Has Vultr a 2014 start up, bitten off more than they can chew by positioning themselves firmly in what is Digitalocean's playground? 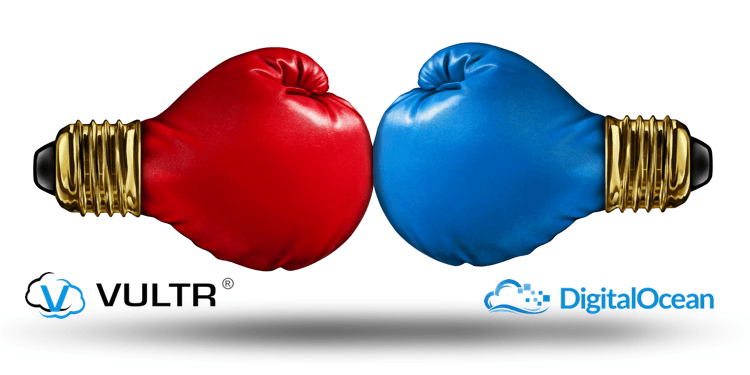 Vultr vs Digitalocean - let's find a winner! The question is, do you want 5GB more storage, or would you like 256MB more RAM? We are talking entry level VPS here, so for me if you have an OS or application that consumes more than 15GB of space, you will need more RAM and CPU to power it than what is on offer with a $5 package. 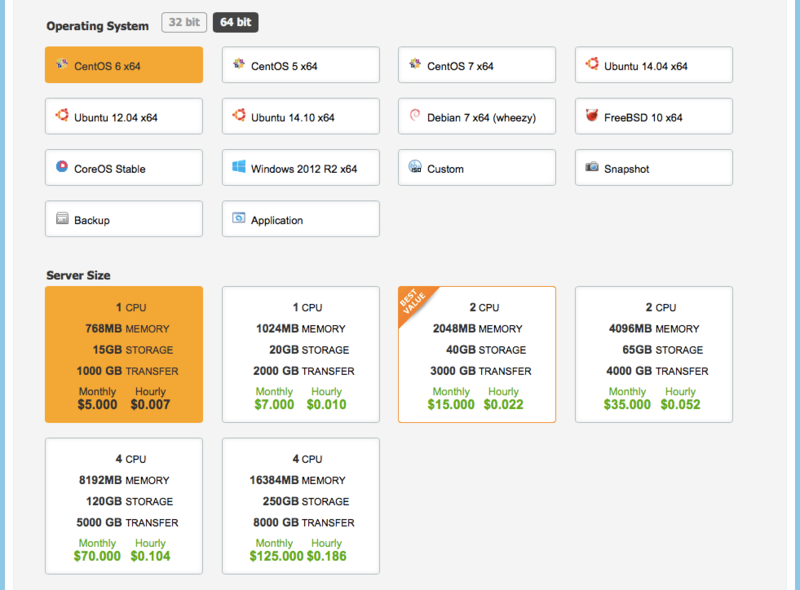 With entry level VPS an extra 256MB of RAM, 30% more, is more useful than an extra 5GB of space. Having 5GB more is not as useful as it seems from the outset. Therefore the additional memory is far more useful in my opinion. It's a close one to call but for me Vultr just edges this one, very marginally though. If you are looking to use your VPS as a webserver, you can skip this section. It is possible to install something like CentOS and then manually install all the bits needed to create a webserver. Why make life more difficult than it needs to be? Use the application installers if you want a webserver, these are covered later in this review. 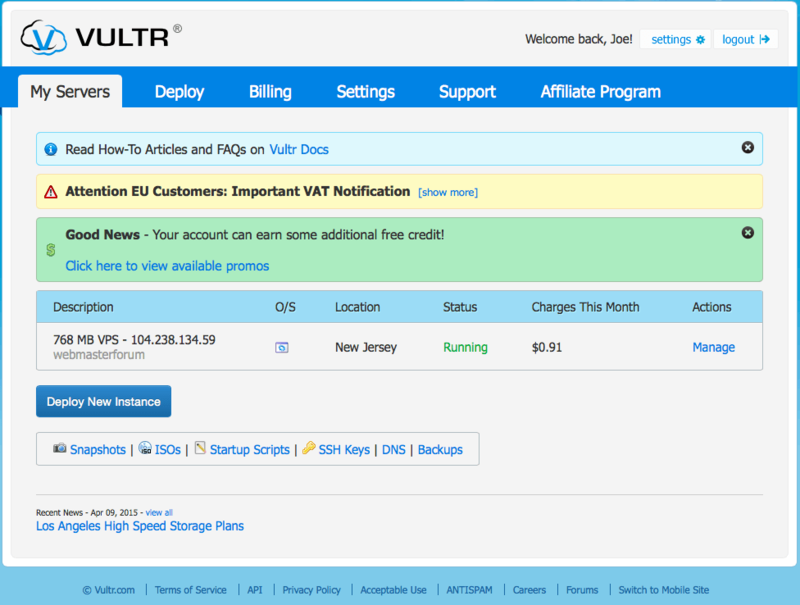 If you want a raw OS then read on to see who wins this part of the Vultr vs Digitalocean battle. Here we start to see Vultr pull away and put a gap between what they offer and what Digitalocean can offer. This Vultr vs Digitalocean battle gets really interesting with the additional benefit of Windows 2012 and a Custom ISO. Vultr allows installation of Windows 2012 R2 plus any Custom ISO. What is a CustomISO anyway? The operating systems listed in the chart above are what Vultr can offer you as a one click install. The Custom ISO means, that if you have access to an ISO, you can install a further 28 Linux and UNIX distibutions, plus all the versions Windows back to 1995! For those of you that want the power of VPS, without the hassle of managing a server, then this is where one click application installers come into their own. Unless you are a developer, or have a specific reason to use a specific operating system, then go with a one click install. I am quite technical, I am reasonably ok at handling shell commands (these are what you use to manage a Linux/UNIX Operating System). I am also quite handy with Windows Servers. Not too long ago I got the VPS bug and created all my websites on VPS, using Ubuntu, CentOS and Windows 2008. I installed website panels for server management and made the servers exactly the way I liked them. Everything was bliss until a website crash. I would add this tweak and that tweak, I followed recommendations on forums to get the site running again. The Linux/UNIX community are great like that. A few weeks later though, another crash. One click application installers allow you to have state of the art SSD hosting, without the hassle of managing an OS. I quickly got fed up of this apprach because I spent more time looking after the OS than content writing. I moved my sites back to my trusty shared hosting providers HostNine and Hostgator so I could focus on content creation. I then came across Digitalocean and saw their one click application installers..... and BOOM! I could have quick, responsive, SSD hosting, at affordable prices, without the need to manage the OS. By using Webmin (free) and cPanel (additional license needed) I can get the setup I liked, but someone else has gone to the trouble of tuning the OS to run these apps. Better still, I could just put WordPress, Magento, Joomla or Drupal straight onto the VPS and not have to worry about installing anything. Just click and go! WordPress, Drupal, Joomla, Magento - in a couple of clicks you are good to go. On the face of it Digitalocean looks like it wipes the floor with Vultr. Vultr has the caveat that more is coming soon. However is more always better? Digitalocean built their reputation as a platform for developers, they have done that as good as anyone out there. Including the mighty Amazon and Google. As a developer needing any of the applications on the list above, Digitalocean wins hands down. However, maybe Vultr doesn't want to wrestle Digitalocean for it's developer audience. 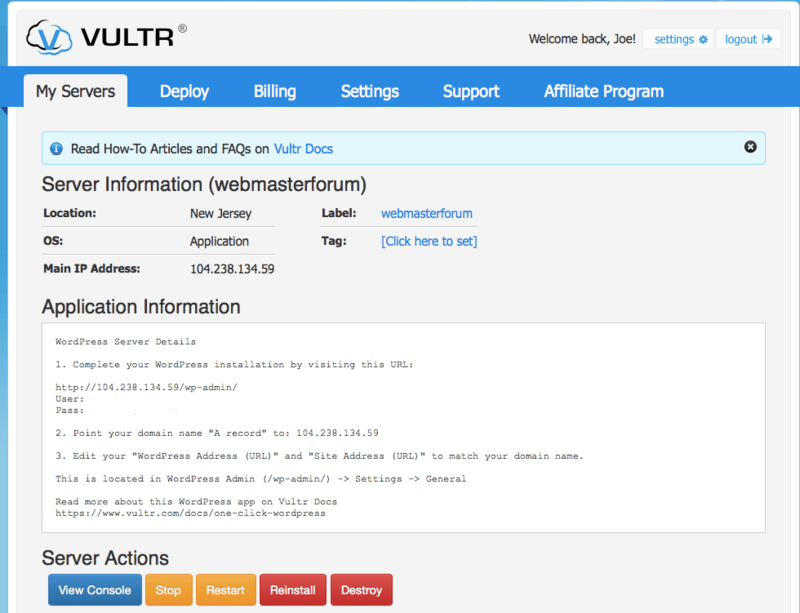 Maybe Vultr is going after bloggers and website creators and their application offerings are far more useful to those types of users. Looking at the application installers they offer. Vultr is aimed at bloggers and website creators, Digitalocean is aimed at developers. 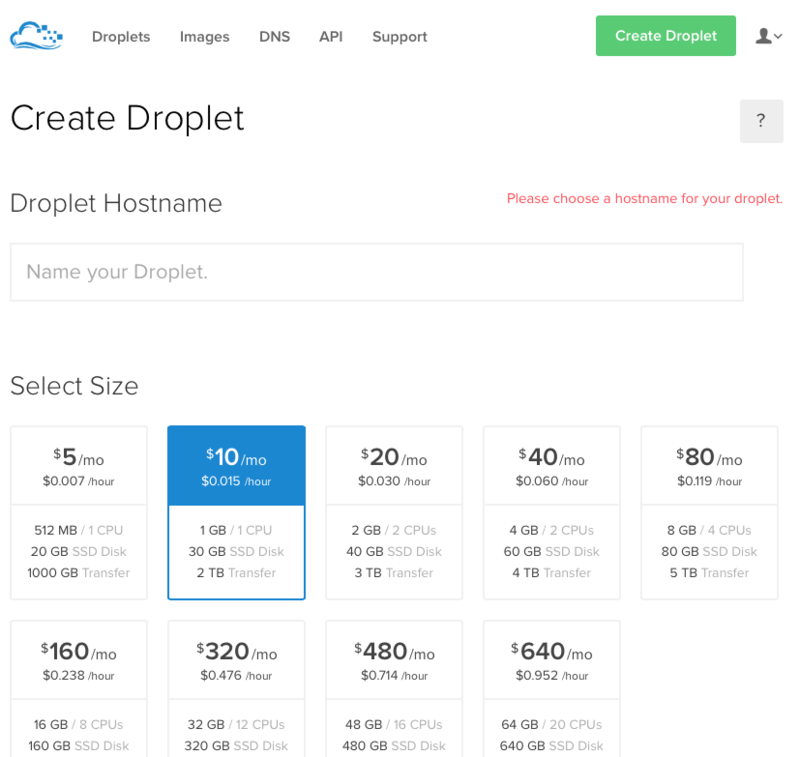 As a developer I would use Digitalocean and as a blogger or website creator I would use Vultr. Why are locations important? When I first started out building websites this really mattered. However as the internet has grown into the monster that it is today, it doesn't matter so much. There are high speed links interconnecting Continents. I doubt very much if you are based in the US, accessing a website hosted in the UK, you will notice hardly any difference in terms of speed. The only practical application I can think of is that you want to load balance your website or application across multiple locations. This reduces the risk of downtime, if there is an issue within a datacentre. 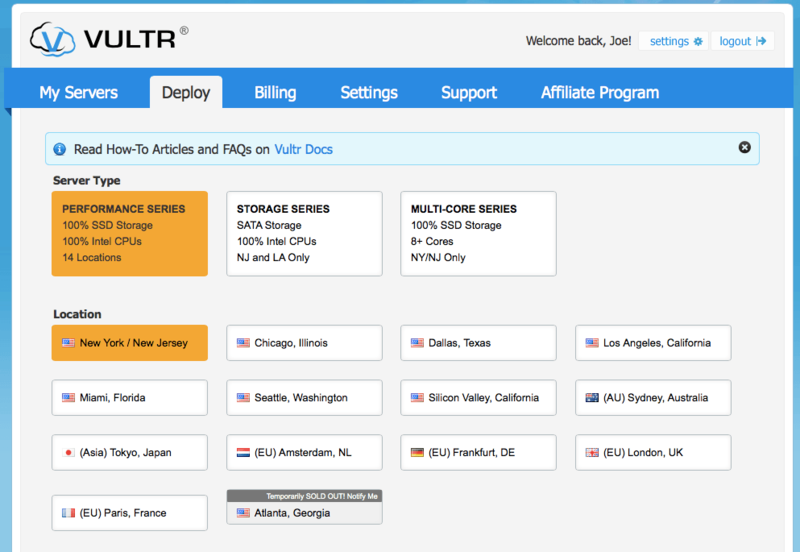 You may also want to consider taking a VPS with both Vultr AND Digitialocean as this spreads the risk across different providers. Load balancers are a discussion for another day, but if that is what you are thinking, then get a VPS from each provider in different continents. Each provider also has the ability to add a private network between servers. What this means is that transfers don't count towards your bandwidth and happen at a higher transfer speed. Vultr as you can see wipes the floor with Digitalocean in this Vultr vs Digitalocean battle, when it comes to available locations. However it's a bit like owning a super car and living in a city centre. What's the point? Other than it gives you bragging rights when you are with your mates at the pub :-). 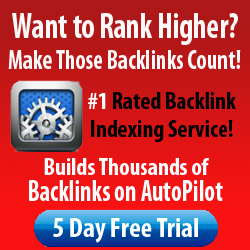 As a developer you can spread your applications across the globe, or as website creator do the same to for SEO purposes. 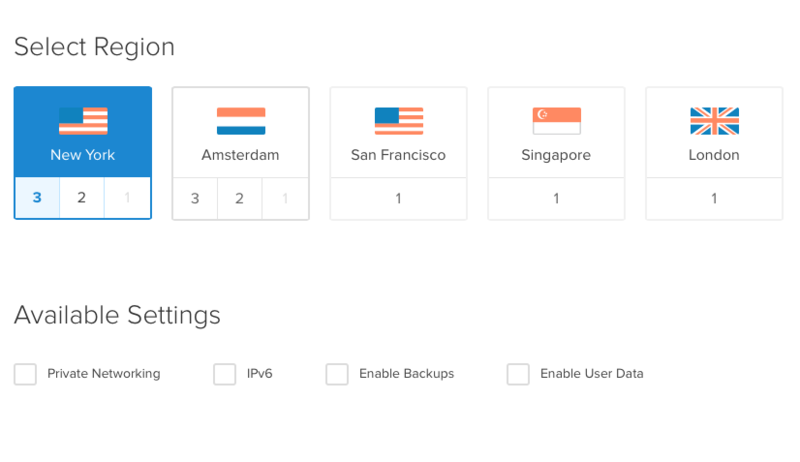 The fact that both providers offer VPS in multiple locations, is enough for me to declare this particular round in the Vultr vs Digitalocean battle a draw. The number of locations is not as relevant as it used to be. We've taken a look at the hardware these two offer. The software that drives the whole thing is just as importantant. There is no point having all that power and not being able to use it. 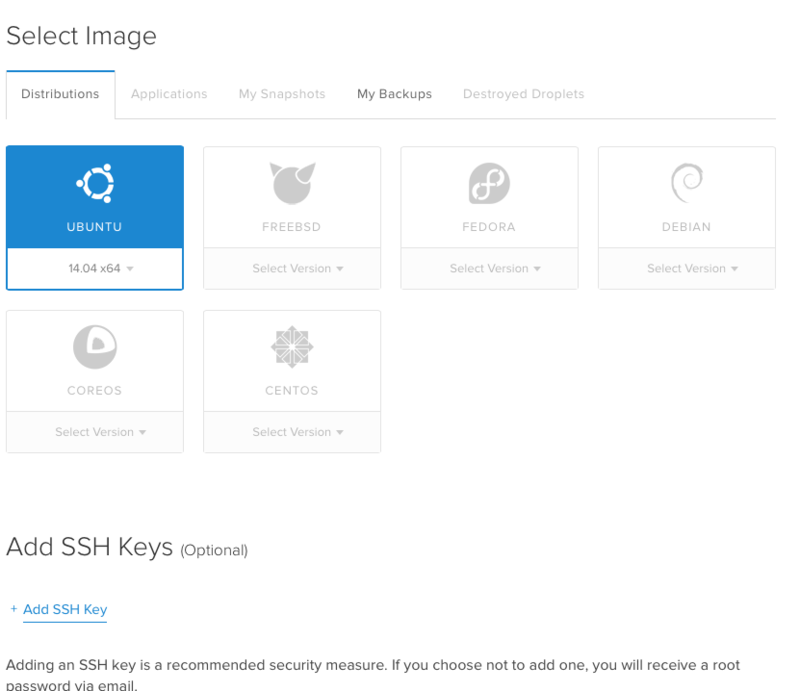 First up in the Vultr vs Digitalocean control panel contest is Vultr. The control panel is well layed out and there is nothing particularly complex about it. Select which OS you would like, if you wish to go with a CustomISO (you will be promoted to upload this), a previously taken Snapshot (more on snapshots later), a Backup (more on this later) or an Application. If you select the Application option, a drop down magically appears and you can select which Application you would like to deploy. Then select your server spec and finally you have the advanced options, should you chose any. IPv6 is there to future proof your servers. We are running out of IPv4 addresses and shortly we will be needing to move over to IPv6. Private Network enables you to copy files between servers and it doesn't count towards your bandwidth. Note however, the servers can only be the servers under the same account and file copies need to be within the same datacentre. Startup scripts are useful if you have a standard build for your servers. You can run them to save yourself a lot of hardwork post VPS build. SSH Keys enable the use of enryption keys in place of usernames and passwords. Useful for file copies, scripting and other advanced features. Give the server a friendly name and then hit place order. YOU WILL NOT RECEIVE ANY FURTHER CONFIRMATION AND WILL START TO BE BILLED FOR YOUR VPS! Within a couple of minutes your brand new VPS will be up and running. You will recieve any email to confirm. You also have the options to view usuage graphs, buy additional IP address ($2 extra per IP), view IPv6 information, upload a custom ISO, take and view Snapshots and take and view Backups. To delete the VPS just simply click Destroy (unlike create you are asked to confirm), you will no longer be billed for the VPS once it has been destoryed. You can also Reinstall, Reboot and Shutdown your VPS. A small note about changing plans, you have to take a Snapshot and then deploy a new VPS in order to increase the number of resources. You specify the Snapshot as the source of the new VPS during deployment. Overall I find Vultr's Control Panel usable, it would be nice to be able to one click upgrade my VPS without Snapshoting and Destorying the old one. As you can see, there isn't much difference between the Vultr Control Panel. All the options are pretty self explainatory. With the exception of a couple. Private Networking - this allows you to copy files between two Droplets in the same Datacentre, without it counting towards your bandwidth. Enable User Data - this is what Vultr calls startup scripts and allows for advanced operating system configuration to be installed post install. When Vultr came into existance in 2014, they took a very successful Control Panel and replicated it. Well you have made it this far in the Vultr vs Digitalocean shoot out and we are into the final round. Make no mistake this is probably the most important round. Everything else we have covered so far you can tweak yourself. In the case of the Control Panel, live with a poor design so long as all the features are there. Locations are fixed as well, but at least you have some choice there. What you can't do is make the hardware perform better than it should.